Norovirus strains are known to cause recurring epidemics of winter vomiting disease. The crystal structure of the capsid protein of VA387, a representative of the clinically important GII.4 genocluster, was recently solved in complex with histo-blood group A- and B-trisaccharides. However, the VA387 strain is known to bind also to other natural carbohydrates for which detailed structural information of the complexes is not available. In this study we have computationally explored the fit of the VA387 with a set of naturally occurring carbohydrate ligands containing a terminal α1,2-linked fucose. MD simulations both with explicit and implicit solvent models indicate that type 1 and 3 extensions of the ABO-determinant including ALeb and BLeb pentasaccharides can be well accommodated in the site. Scoring with Glide XP indicates that the downstream extensions of the ABO-determinants give an increase in binding strength, although the α1,2-linked fucose is the single strongest interacting residue. 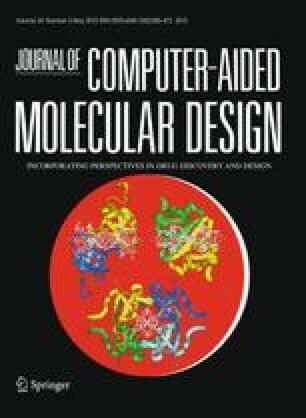 An error was discovered in the geometry of the GalNAc-Gal moiety of the published crystal structure of the A-trisaccharide/VA387 complex. The present modeling of the complexes with histo-blood group A-active structures shows some contacts which provide insight into mutational data, explaining the involvement of I389 and Q331. Our results can be applicable in structure-based design of adhesion inhibitors of noroviruses. The online version of this article (doi: 10.1007/s10822-010-9353-5) contains supplementary material, which is available to authorized users. Grants from the Swedish research council (8266) and from governmental funds to the Sahlgrenska University Hospital and financial support from Biognos AB, Göteborg, are gratefully acknowledged. We are grateful for valuable discussions with Drs. I. Pascher, S. Sundell and G. Kemp.